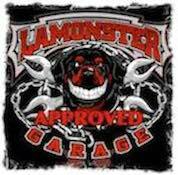 Here they are the latest and greatest accessory from Lamonster Garage!!! The IPS Gripper peg insert is to replace the bland basic look of your stock peg insert and make it pop with the Lamonster style you have become accustom too. This gives your stock F3 foot peg a custom look and feel. These fit all F3 models rider and passenger OEM pegs. The insert also has a highway bracket option (SOLD SEPARATELY) LG-1046. Available in all Black or Accent Cut.